This is the second in a post series of ‘excerpts’ from my book The Urban Sketcher. This time I’m going right back to the very first lesson in the book; Sight Measuring. I shouldn’t really call these excerpts. This is more like the director’s cut. Here’s the full length text, before edits for word count limits and layout. Mainly, because this is the text I have easily available in electronic form, but also, so you get the full explanation, and larger pictures. You are probably familiar with the image of the artist with their arm extended, holding a brush upright, their thumb up like a hitchhiker. Usually they are shown with their eyes squinted and tongue sticking out. This is not just a funny cartoon image of an artist – it’s a real measuring technique! In this shot I am checking things like the angle of the sloped street, and the height of the windows. The idea is, we want to spot errors in proportion in the first few minutes of a sketch. I use two simple techniques called Sight Measuring and Angle Checking. These are a simplified version of what academic ateliers might call Sight-Size Drawing. 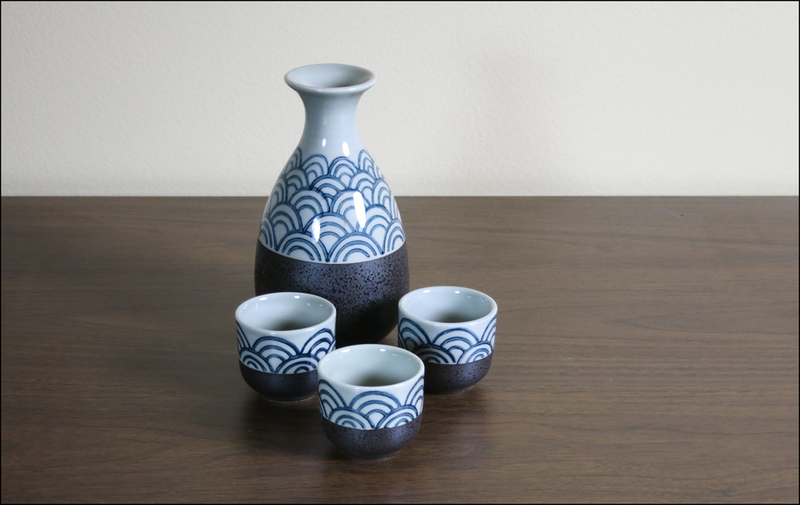 This sake set, found at a Chinatown knickknack shop, is a great introductory subject for sketching ‘outside in’. To recap, the plan of attack is: get the outside silhouette shape first, spot check your accuracy, and then proceed to subdivide into smaller and smaller details until the whole thing is drawn. The very first step is to decide roughly how large you want the drawing on the page. Mark a small dash at the top and the bottom of your subject and lightly sketch a ‘scribble’ of the outside shape. No internal detail, just the silhouette, as if it was cut out of a piece of paper. (Pencil sketch is darkened for clarity). This simple outline is all you need to ensure accumulating proportional errors don’t expand off the edge of the page. You have a ‘box’ to work within. All future details will fit inside this box. Or that is, they will, once we make sure the silhouette is accurate. Here’s how sight measuring works. As you look at the subject, extend your arm straight (elbow locked), and line up the tip of your pencil with the top of the subject. Slide your thumb down until it’s lined up with the base. That position you’ve marked on your brush or pencil – that is a unit measure you can use to check against other objects. 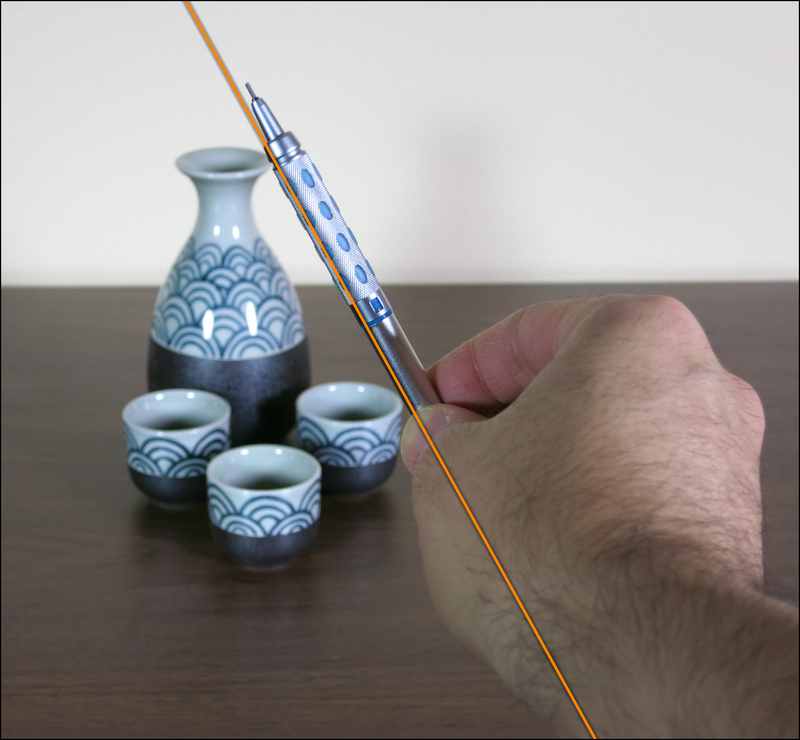 Keep your thumb in position on the pencil to preserve the measurement you have marked. Keep your elbow locked to maintain the same distance from the subject. Now, look for something you can compare your measurement against. It so happens that the height of the jar is equal to the width across the three cups. So, if we compare the height and width on our drawing– oops! The drawing is not correct. See how we have caught that error with this simple measuring trick? It’s really not a big deal, this is a pretty small error. 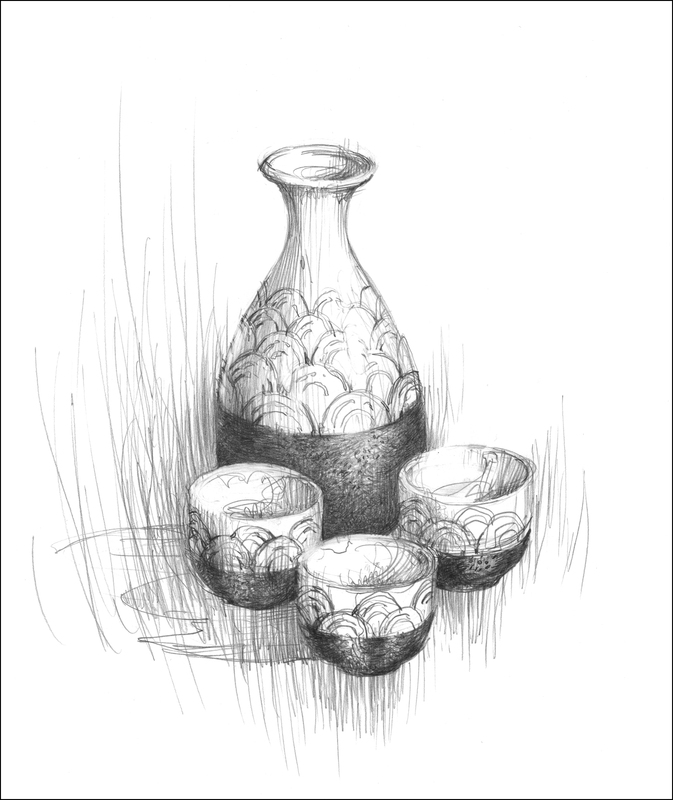 In a simple subject like this it wouldn’t really matter that much, it’s not like people won’t know it’s a sake set :) But since it’s so easy to spot the issue and fix it, I might as well refine my sketch. 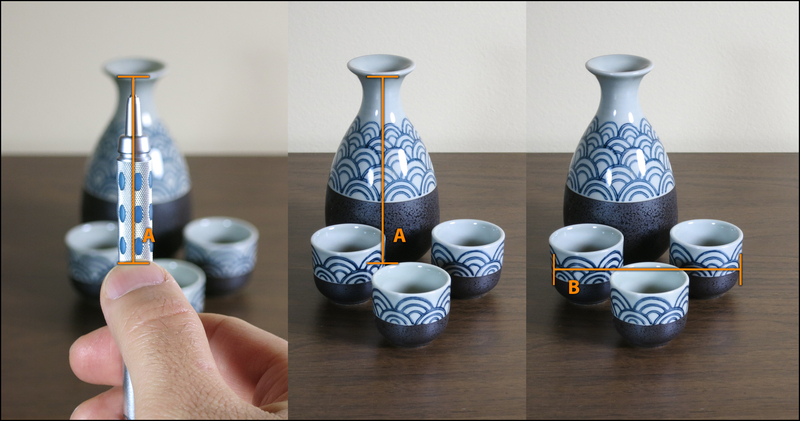 I’ll make that fix to the silhouette so that the jar height (A) matches the cup width (B). Blue lines are the original scribble, grey pencil the revised drawing. 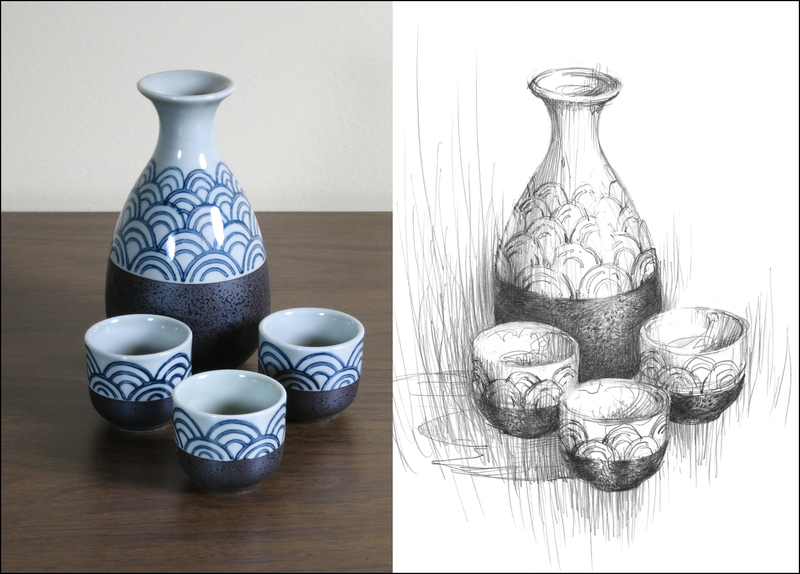 The other big thing in this step is to sketch in the dividing line between the dark ceramic base and the upper patterned area. And, I fix a proportion error on the width of the neck. This is what I mean by working larger-to-smaller. Once you have the outside shape, what is the next biggest thing you can draw? The ‘waist’ of the bottle is the next-to-largest shape. Dividing the jar in half. If you keep dividing each shape by half, eventually you are drawing very small details. The other kind of sight measurement is what I call an Angle Check. Measuring the slope between two points. When drawing outdoors, this is ideal for finding roof lines or checking perspective on narrowing city streets. Place the base of the pencil on the first point, (the edge of the cup) holding the pencil perfectly vertically, rotate the tip until it lines up with your second point (the lip of the jar). In this case, rotating counter clockwise. Now – lock your wrist. Don’t lose the angle of the pencil. 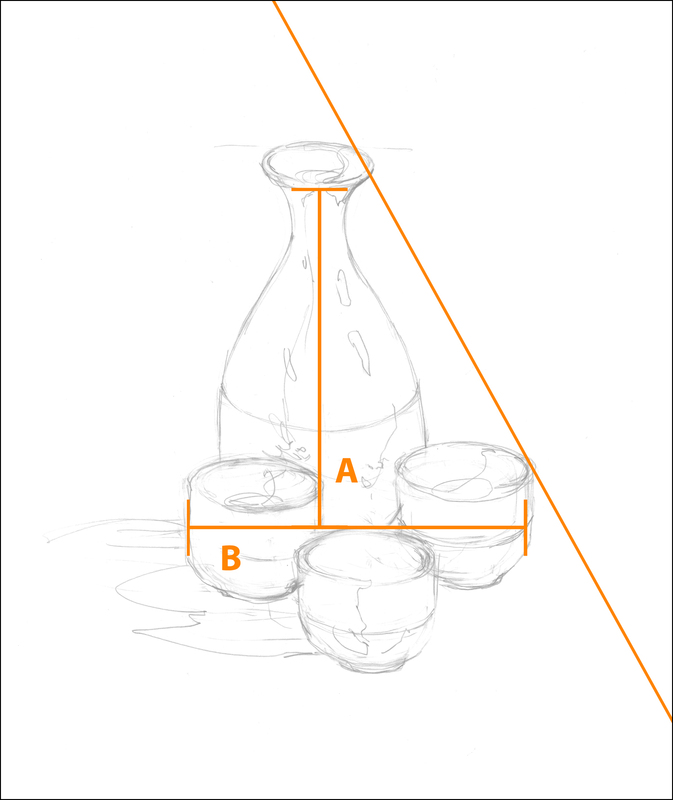 Place it over your drawing, and see how well the angle lines up with what you’ve drawn. Not too bad hey? It’s looking reasonably close after widening those cups. At this point, my planning is done. I can sit back and have fun with the pattern. That fish scale design is what attracted me to the thing in the first place. But by starting outside-in, I can see for certain I have a shape I like before I get into those details. I want to be able to freely scribble in that pattern, without a care in the world. 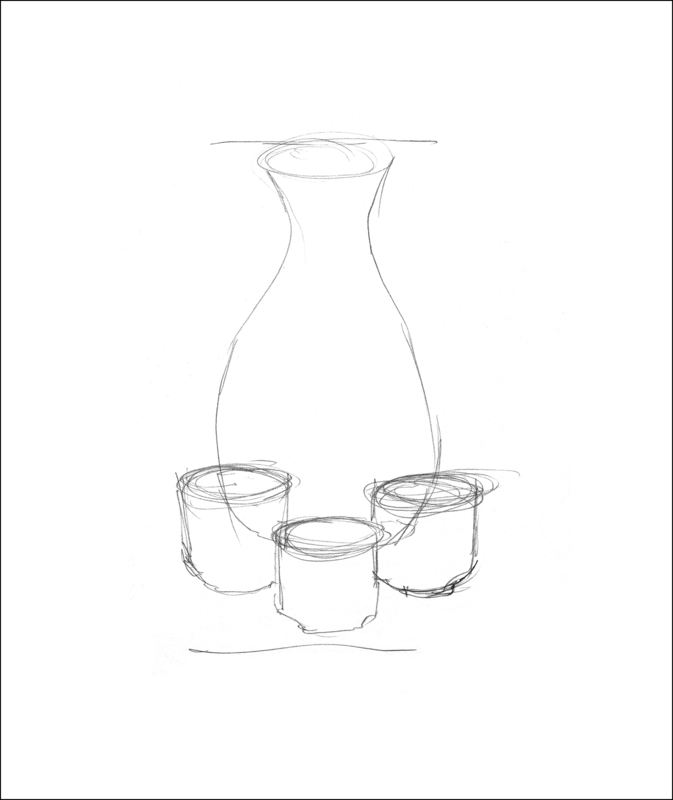 It’s a picky thing, sketching those repeating shapes – and I don’t want to stiffen up while doing it. I wouldn’t feel as ‘ free’ if I wasn’t sure about the underlying structure. If I had to start and stop the pattern a few times, erasing and correcting the shape, it wouldn’t turn out as ‘loose and sketchy’ as I want. 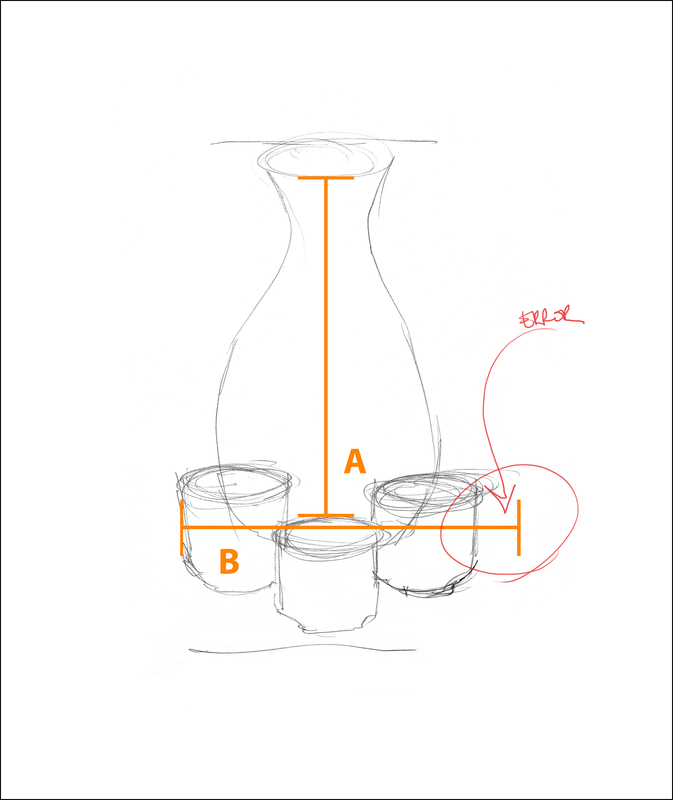 Oddly, it’s the measuring that allows the sketch to look spontaneous. I’ve heard artists use a saying; ‘loose is how a drawing looks, not how it’s made’. This particular example is fairly faithful to reality, because the subject is an easy one. As we move on through the book, you’ll see I only use as much precision as I need to get the sketch on paper. Those measurements only took seconds to do. In no way do I want this to become hard labor. My feeling is, you should do whatever measuring you need to do so that you are satisfied with your drawing. You decide how accurate you want it to be. I enjoy it when everyone can recognize my subjects, but I don’t want to be doing so much measuring that the drawing feels mechanical. Accuracy is a skill I want to have, it helps me do more challenging things. But I don’t ever want it to slow me down. Thank you so very much for posting these “excerpts”. I am learning so much from the book and from the Craftsy class. These will be wonderful additions! I am very excited and can’t wait for it to arrive!!!!!! I bought the book – it’s excellent. I’ve been drawing for years but still find plenty of new stuff within your pages.